Have proponents of the tight building envelope got it all wrong? Anthony Brenner and David Mosrie of Asheville, N.C.–based Push Design think so. Their reasoning is that while builders can specify non–off-gassing materials, they can’t control the durable goods (furniture and the like) that homeowners bring in, which may be loaded with chemicals. An air-tight house that uses less energy may do so at the expense of human health, if it has the negative side-effect of trapping harmful toxins inside. Better to build a home that breathes. Asheville’s “Push House” is built with Hemcrete, an eco-friendly compound of industrial hemp, hydraulic lime, and water. This home is fireproof, waterproof, mold-proof, insect-proof, and gets an “A” for indoor air quality. Its secret? Industrial hemp. The firm’s prototypical “Push House” offers just such an example. 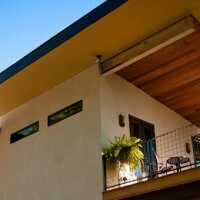 Its stucco-like exterior walls are actually made of 12-inch-thick Hemcrete, a biocomposite masonry compound that’s mold-resistant, bug-proof, and recyclable. And get this: Hemcrete sequesters carbon and other “nasty stuff” from the atmosphere and undergoes a natural petrification process as air filters through it, becoming stronger over time. Hemcrete’s virtues are well-known in Europe, where it is used for everything from walls to roof insulation, but the Push House marks its first residential foray on this side of the Atlantic. Brenner estimates the cost of each exterior wall at $25 to $30 per cubic foot, but that’s partly because some raw materials had to be imported from the U.K. Domestic production could cut the price tag in half, he says, except for one problem. It’s illegal in the U.S. to grow Hemcrete’s primary ingredient—industrial hemp—which is derived from the stalk of the cannabis plant. Although builder interest in the material is as yet undetermined, there’s no shortage of cash-strapped farmers interested in growing the rapidly renewable plant. In fact, 11 states have approved its cultivation under state law. But the U.S. Drug Enforcement Agency has so far nipped all such enterprises in the bud.